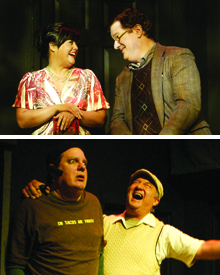 The Little Fish Theatre, located in heart of San Pedro, has made a name for itself in the world of small theater. This intimate venue features a collection of classical and contemporary plays throughout the year. Created by the producer and director of Shakespeare by the Sea, the small production company has put on outstanding performances since 2002. The annual "Pick of the Vine" is well known amongst Little Fish Theatre goers. Over five hundred plays are submitted to Little Fish annually in hopes of being featured in the Pick of the Vine. This year eight plays have been selected: "The Kiss," "A Name," "The True Cost Heavenly Birth Insurance," "The Divine Visitation of Joe Pickelsimer," "A Fine Romance," "The Eiffel Truth," "Disconnections," and "One for the Chipper." Each play is reviewed and voted on in hopes of being considered to be included in this evening of eclectic plays that are sure to inspire yet another wonderful season of Pick of the Vine. Fridays and Saturday, January 11 - February 16, 8 pm; Sundays, February 3 and February 10 at 2 pm, Wednesday & Thursday, February 6 & 7, 8 pm.